I find the #1 reason why people struggle with implementing a healthier diet is that they don’t spend a few minutes every week planning their meals. As a result, we get home after a crazy day at work with nothing in the fridge. How many times does that end up as a pizza or Chinese take-out? Or, you have a hectic day at work, didn’t bring lunch and you end up in front of the vending machine at 3:00 in the afternoon with the choice between a candy bar or processed cheese filled crackers. A great alternative is to create some dedicated quiet time every week to develop your eating plan for the week. Try making it a regular time slot like over coffee on Saturday morning or after your read the paper on Sunday. It only takes about 15 minutes to think through your week which means identifying those days that you will be home late, so you need an easy quick meal or especially busy days at work when you know that best strategy is to pack a lunch for that day. A good idea is to keep a list of your top 15 favorite delicious healthy meals. Eating is very similar to wardrobe management. The truth is we tend to choose the same 20% of our closet on a regular basis. The same is true in our food choices. If you already have about 15 or so tried and true recipes and you mix that with some eating out over a 3-week period, you will have 21 meals for dinner or a 3-week cycle menu. It’s hard to get tired of any entrée if you only eat it one time in three weeks. If you have recipes that you like but are not healthy, modify them to make them lighter. Reducing sugar, salt, refined carbs and fat is very easy especially if you use interesting substitutions. For more on this check my blog post on Tasty Recipe Hacks to Spring into Health. Good resources for healthy recipes include Cooking Light and Eating Well magazines and websites. Or, you can also just Google ‘healthy recipes.’ So, if you have a recipe for macaroni and cheese that you want to modify, just Google “healthy mac and cheese.” You will be amazed how delicious Healthier Baked Mac and Cheese is made with whole wheat pasta, low fat milk, and chicken broth. It is still just as creamy and cheesy as ever. You may also be interested in an earlier blog post of mine: 5 Super Veggies for Spring Detoxification. The next step is to identify a regular food shopping day. 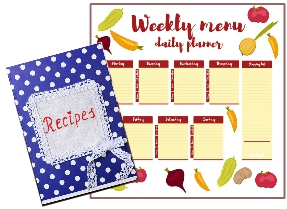 Create a shopping list from your recipes and meal plan and shop for the entire week. It is a good idea to keep a small pad of paper in the kitchen to note ingredients that you run low on while cooking. If you are ridiculously busy during the week, it might make sense to take some time on a weekend day to some pre-prep. 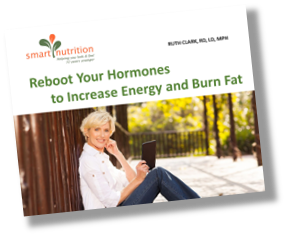 Every once in awhile it is fun and interesting to try a new recipe to add to your cycle menu. You can even use it as a date night or an evening to hang out with the girls (or guys). Make a double batch of soup, sauce or a casserole and throw it in the freezer. Be sure to date and identify them. When making one of your favorite recipes, it’s often easy to make 1-1/2 times normal and store that extra portion for lunch over the next few days. It’s easy to get overwhelmed when your fridge is over-full and not organized. Also, things get hidden in the back, lost behind the leftover rice carton. Don’t let things go bad. 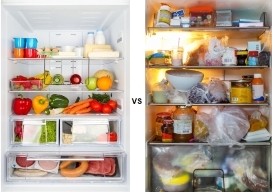 Keep your fridge airy and light, with a sensible, realistic amount of food in it. Keep a list nearby of everything in the fridge, especially leftovers, as a visual reminder of what remains to be eaten. Use glass containers to store food to make it quick and easy to identify. Don’t worry if you aren’t perfect. It’s all about creating new habits. The more consistent you are about planning the easier it will be to have delicious nutritious foods always at your fingertips.